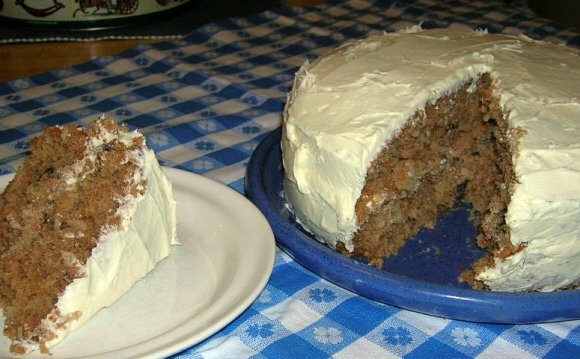 Heres home-baked carrot cake minus the hassle of shredding carrots. Yum! 1. Temperature range to 350F. Grease and flour bottoms just of 2 circular pans, 8x1 1/2 or 9x1 1/2 ins. 2. Beat dessert blend, water, oil, eggs and pineapple in large bowl with electric mixer on reasonable rate 30 moments. Beat on medium speed 2 minutes. Stir in nuts, coconut and raisins. Pour into pans. 3. Bake 8-inch rounds 40 to 45 moments, 9-inch rounds 28 to 32 minutes, or until toothpick placed in center is released clean. Cool ten full minutes. Run knife around side of pans to loosen desserts; pull from pans to wire rack. Cool completely, about one hour. 4. Spot 1 cake level, curved side down, on providing dish. Spread with about 1/3 glass frosting. Put other layer, rounded side up, over the top. Frost side and top of dessert with continuing to be frosting. Store covered in fridge. For main dish or variation, don't use 8-inch pans. Heat range to 375F and reduce oil to 1/3 glass. For primary meal, blend 1/3 glass Gold Medal® all-purpose flour into dried out dessert mix. For difference, stir 1/4 cup flour into dried out cake combine.